Independent Scotland? By reader request, here are transits and progressions for Great Britain for the day of the impending Scottish independence vote. Progressed Sun/Pallas/Mercury/North-Node almost-stellium: certainly indicative of a growing interest in independence by persons in Great Britain, but it's not as strong now as it will be in 2016. Progressed Venus ruling Ninth House conjunct Great Britain Neptune: dissolution, either of material resources, social ties, and/or things of a legal/philosophical nature. Note that the peak was months ago. Transiting Pluto trine Great Britain Mercury: Pluto is death and Mercury is communication (the people communicate by voting), but the trine suggests more of a "brush with death" than actual death. In a couple of years, Pluto will be at the Ascendant, opposite Great Britain's Mars: this configuration looks more powerful than the one for the impending Scottish vote. Transiting Saturn trine Great Britain Mars, ruler of Third House and Tenth House. Like the Pluto transit, this is a trine, suggesting difficulty and struggle but also reinforcement and added strength. Transiting Mars opposite Great Britain Saturn, ruler of Ascendant and Second House: an attack on the existing ruling structure. But this transit actually peaks about three days after the election. Transiting Mercury/Pallas/North-Node triple conjunction: certainly something "libertarian" wants to happen in the world such as a peace treaty, a secession, or the repeal of a law. But the first peak is over and the second yet to occur. Transiting Moon conjunct Great Britain Mars, ruler of Third House and Tenth House: The people (Moon) speak (Third House), as it were. 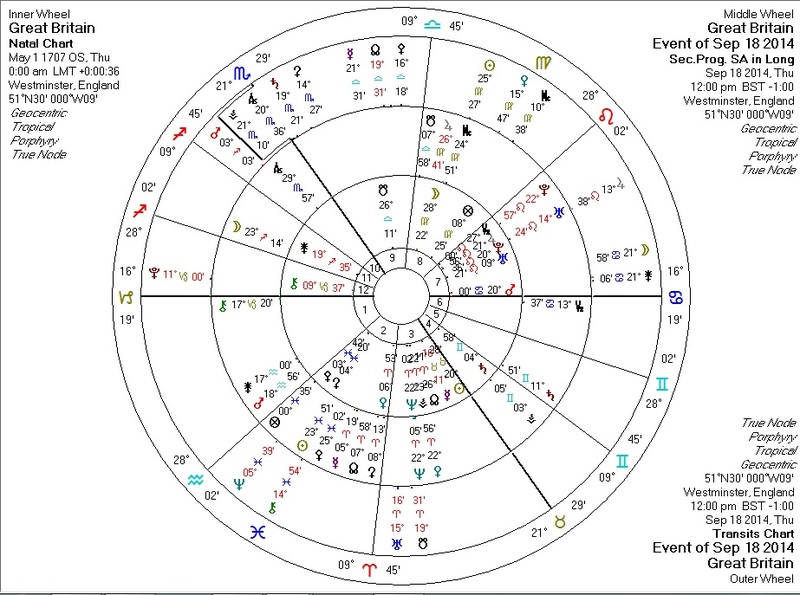 To reinforce the existing structure (conjunct Mars, ruling the Tenth)?